TornadoFX has begun to bridge the gap between the RCP platforms by providing Workspaces. While still in its infancy, the default functionality is a solid foundation for business applications in need of the features discussed above. The resulting Workspace consists of a button bar with four default buttons and an empty content area below it. The content area can house any UIComponent. You add a component to the content area by calling workspace.dock() on it. If you show the Workspace without a docked View, it will by default only take up the space needed for the buttons. The window in Figure 16.1 was resized after it was opened. 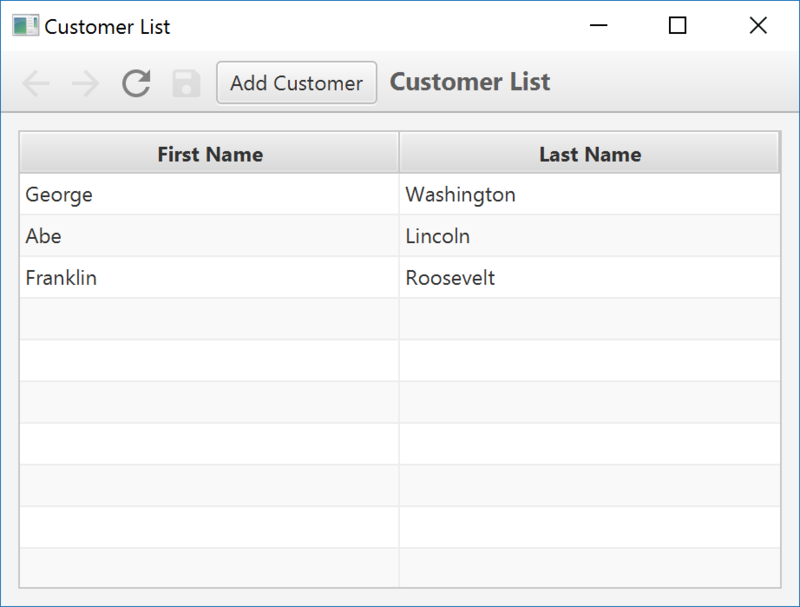 To keep things focused, we will leave out the CustomerList implementation code which simply displays a TableView with some Customers. What is interesting however, is that the Refresh button in the Workspace was enabled when the CustomerList was docked, while the Save button remained disabled. We can achieve the same result by calling disableSave() in the init block, and the same goes for disableRefresh() and disableDelete(). Same goes for the Delete button. We will revisit the Save button and introduce a neat trick to only activate it when there are dirty changes later in this chapter. You may at one point dock a View containing a TabPane inside of a Workspace, and then add tabs which represents further UIComponents. You can quite easily proxy the savable, refreshable and deletable state and actions from the Workspace onto the View represented by the currently active Tab. 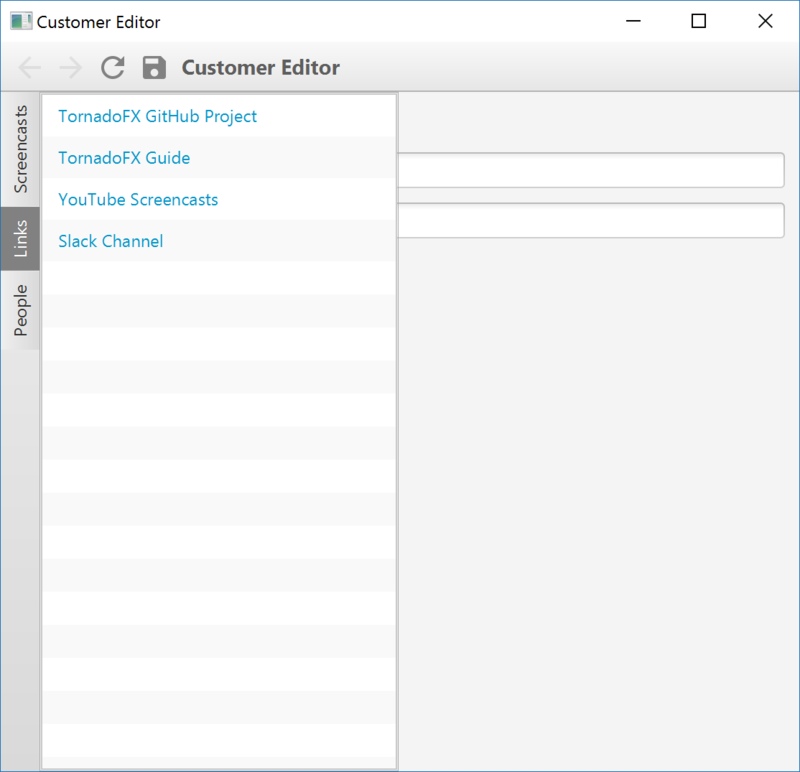 Consider a Customer Editor which has tabs for editing customer data, and one for editing contacts for that customer. 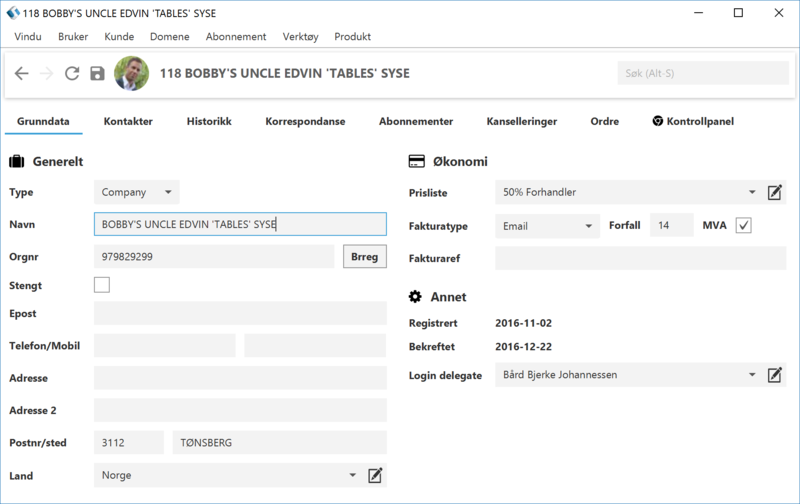 Whenever the user selects one of the tabs, the buttons in the Workspace should interact with the state and actions from the selected tab view. That single call to connectWorkspaceActions() takes care of everything for us. The actual implementation of the two sub views are omitted for brevity, but you can imagine that they share a CustomerViewModel injected into the scope they share for example. This function is declared inside UIComponent, so the savableWhen, deletableWhen, and refreshableWhen are performed on the UIComponent. Those state are then bound to the savable, deletable and refreshable state of the TabPane. But wait... a TabPane does not have those functions?! Yes, in TornadoFX it does :) You can probably guess that the implementation is again another proxy into the currently selected Tab in the TabPane, and a lookup of the UIComponent represented by the content property of that Tab. Whenever the Tab changes (or when the content of the tab changes), the underlying UIComponent is looked up, and the pertinent states are bound to the Workspace. It would also be possible to bind these states and connect the actions more explicitly. You will never or seldom need to do that, but the following example might help your understanding of the proxy mechanism. This little trick enables you to handle the actual reload of the customer in the main view instead of reimplementing it in every tab. As we have seen, the currently docked View controls the Workspace buttons. Some times you dock nested Views inside the main View, and you would like that nested View to control the buttons and actions instead. This can easily be done with the forwardWorkspaceActions function. You can change the forwarding however you see fit, for example on focus or on click on some component inside the nested View. The CRMWorkspace loads three other views into it. 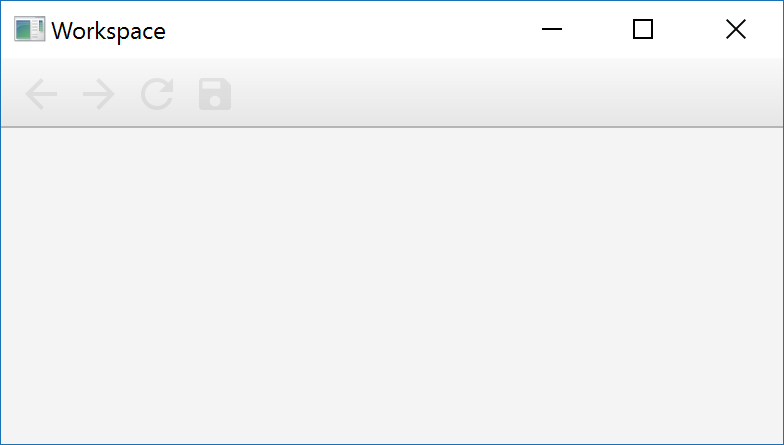 One providing a MenuBar, then the default RestProgressBar is added, and lastly a SearchView providing a search input field is added. The Workspace has a pretty good idea about where to place whatever you add to it. For example, buttons will by default be added after the four default buttons, while other components are added to the far right of the ToolBar. The MenuBar is automatically added above the ToolBar, at the top of the screen. Figure 16.3 shows how it looks in production, with a little bit of custom styling and a CustomerEditor docked into it. This application happens to be in Norwegian, and some of the information in the Customer card has been removed. This particular customerController.save call will return the Customer from the server once it is saved. If the server made any changes to our customer object, they would have been reflected in the saved customer we got back. For that reason, we call customer.update(saved) which is function you get for free if you implement JsonModel. This makes sure that changes from the server is pushed back into the model. 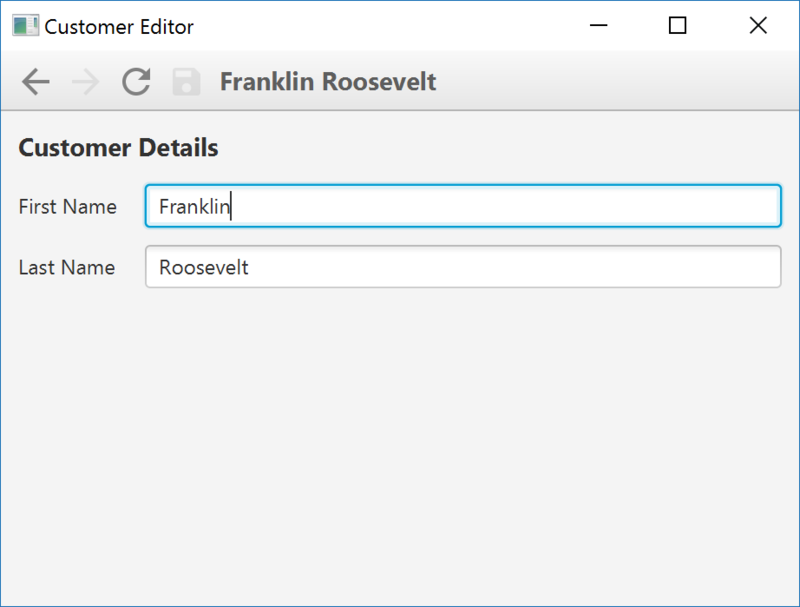 This is completely optional, and you might just want to do customerController.save(customer.item). When a view is docked, the title of the Workspace will match the title of that view. There is also a heading text in the workspace that by default shows the same text as the title. The heading can be overriden by assigning to the heading variable or binding to the headingProperty property. If you want to completely remove the heading, augment the workspace with workspace.headingContainer.hide() or just hide it. You can also put whatever nodes you want inside the heading container. 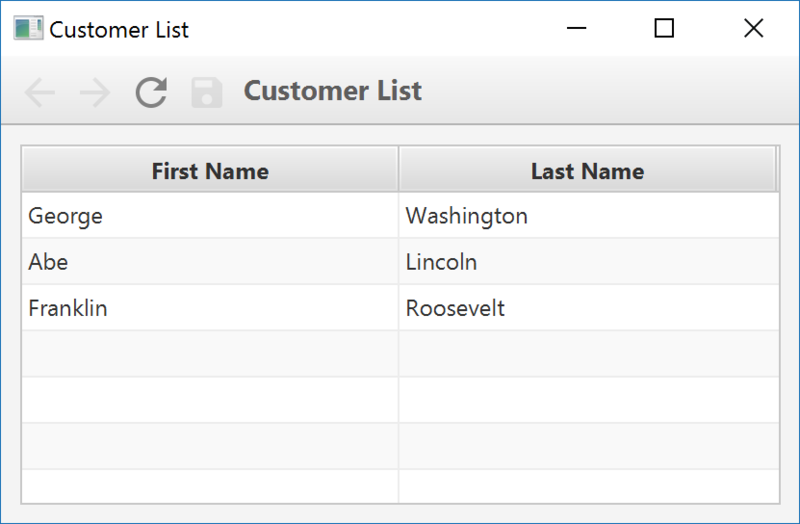 You saw this trick in the CRM screenshot, where a Gravator icon was placed to the left of the customer name. Important: Modifications to the workspace must be made from onDock. Trying to modify the Workspace from init will likely fail, as the workspace is not guaranteed to be available while init is running. You can not change the enable/disable state of native workspace buttons, as the workspace manages these internally based on the properties of the currently docked view. Some views might need more buttons or functionality added to the ToolBar, but once you navigate away from the view it wouldn&apos;t make sense to keep them around. The Workspace will actually track whatever elements you add to it while a view is docked and remove those changes when the view is undocked. The perfect place to add these extra buttons would be the onDock call of the view. The customer model is injected, and will contain the selected customer from the list. The savable property is bound to the dirty property of the model and the headingProperty is bound to a StringBinding called fullName, which concatinates the first and last names and updates whenever they are changed. The form fields bind to the name properties and lastly the onSave and onRefresh functions are implemented to react to the corresponding Workspace buttons. We can see that the title and heading are indeed displaying separate information. Since we haven&apos;t made any edits yet, the Save button is disabled, while the Refresh button is available, and would roll back any changes made since the last commit. The back button is enabled as well, and clicking it would navigate back to the Customer list. This is a very powerful feature which enables browser like navigation in your application with very little effort on your part. The Workspace keeps a navigation stack of configurable depth. By default it will contain 10 previously docked views. You can configure the maxViewStackDepth to change the number of views held in the navigation stack. This is a handy alternative in some situations, but make sure you only choose one of the strategies. When you leverage injected view models together with a navigation stack, some interesting challenges appear that need to be addressed. 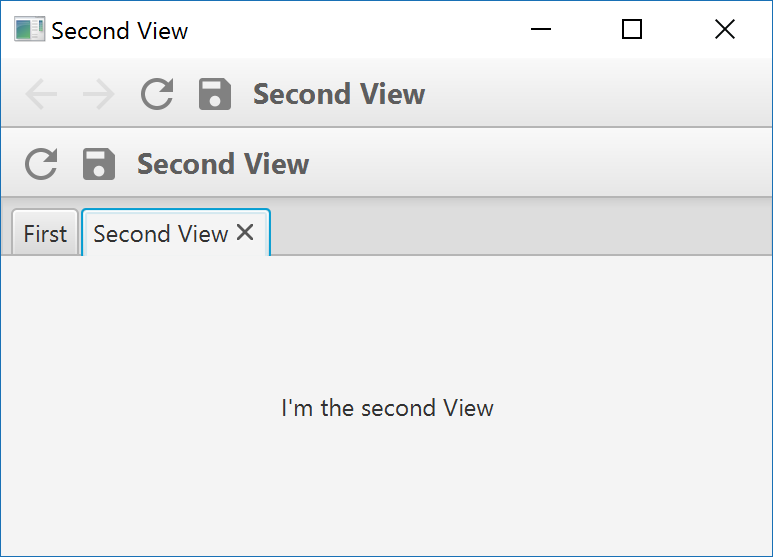 If you removed the Back button (workspace.backButton.removeFromParent()) or set the maxViewStackDepth to 0 you can disregard this particular challenge, but to leverage this powerful navigation paradigm, there are some things you need to think about. Consider our prevous example with an injected CustomerModel that represents the currently selected customer in the CustomerList while also being used by the CustomerEditor to edit that same customer. 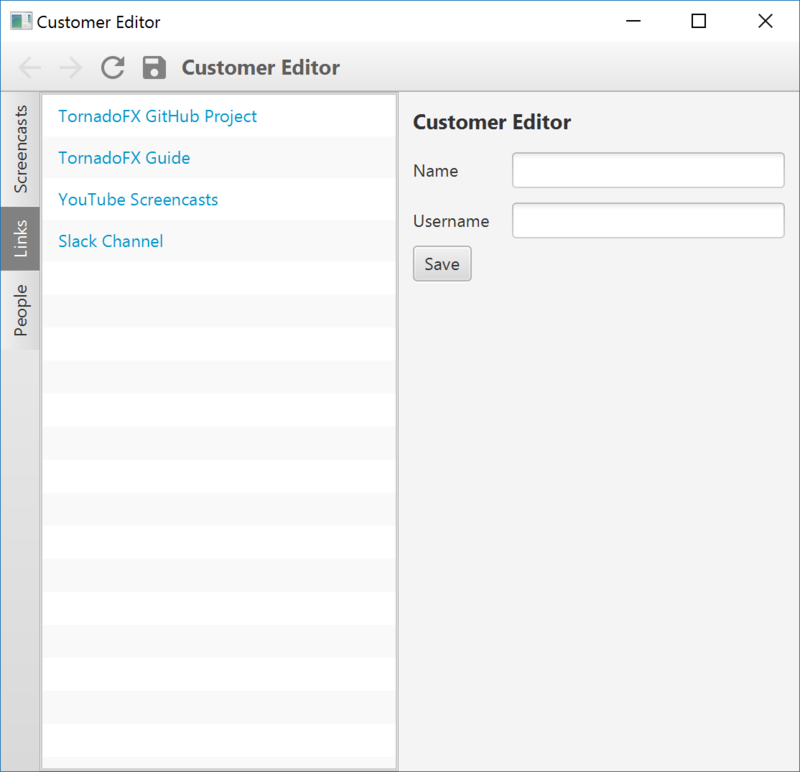 Then let&apos;s assume that there is a way to search for a customer and edit it, perhaps using a TextField in the ToolBar of the Workspace as a search entry point. If you search for a new customer and go on to edit it, then navigate back to the previous customer editor, it would suddenly operate on the last customer you set in the CustomerModel. You can probably imagine the ensuing havoc. Fortunately, the scoping support stretches far into the Workspace feature and provides some handy tools for this particular situation. 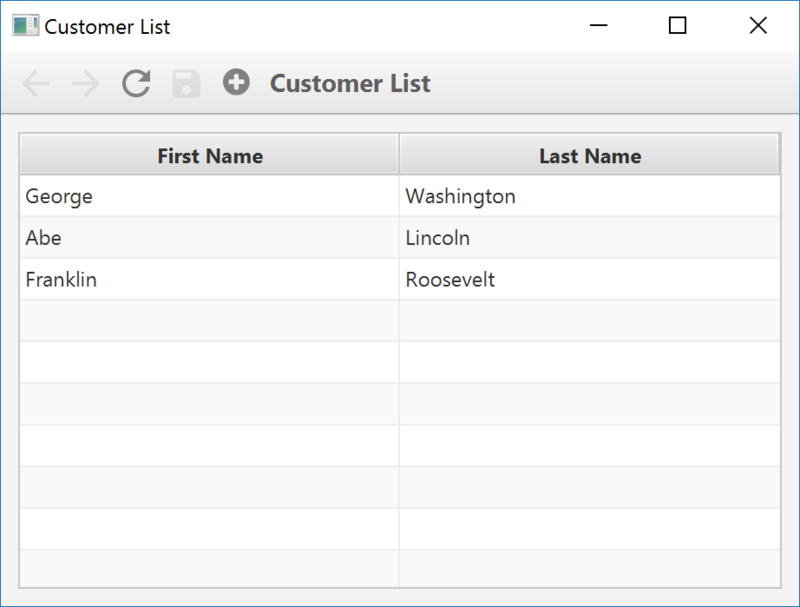 When the CustomerList docks the CustomerEditor later on, it happens in this new scope. But what about the search field? The dockInNewScope function takes a vararg list of injectable objects to insert into the new scope before looking up our CustomerEditor and docking it. Separating scopes this way makes sure we can utilize injected view models without being afraid of other views stepping on our data. It is a pragmatic approach to an intricate problem. It also gives you a way of bleeding injectables into new scopes, should your use case require it. The views docked inside the Workspace tabs will have their onDock function called whenever they are added and also when they are subsequently chosen as the active Tab. Correspondingly, the onUndock function is called whenever it is no longer the active Tab, as well as when it&apos;s removed from the TabPane using the close button on the tab. The Workspace has built in support for the Drawer control. You can access workspace.leftDrawer and workspace.rightDrawer to add items to each drawer. They will show up on either the left or right side whenever you have added one or more items to them. Items added from a View in onDock will automatically be removed when the View is undocked. Items added directly in the Workspace subclass, from the onBeforeShow App callback or from any other place will stay until they are manually removed. The combination of static and dynamic drawer items makes for a very powerful navigation and menu structure. Only your imagination is the limit! In Figure 16.8 we have expanded the Links drawer item. Notice how it pushes the Customer Editor to the right. This could be a good idea depending on the available space and the nature of the docked content. You can change the floating drawer mode in code as well, by setting leftDrawer.floatingDrawers = true. Remember that Views can contribute drawer items programmatically in their onDock callback. Use this to provide extra tools for an advanced editor for example. They can easily communicate between each other using ViewModels. It is recommended to create a new scope to make it easier for these view parts to work in concert on shared data structures. The currently docked View will receive a callback whenever the Back or Forward buttons of the Workspace is clicked. These functions are called onNavigateBack and onNavigateForward. The default implementation returns true to signal that the navigation should proceed. You can however return false to stop the navigation and instead implement your own logic to decide what happens in the UI when one of the navigation buttons are clicked.